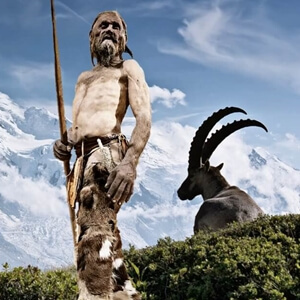 Was Rock & Roll Born in South Tyrol? Okay, we know what you’re thinking: “No way man Rock & Roll was born in ‘Merica in the 1950s by the likes of Chuck Berry and Elvis,” but stick with us. You’re about to receive a history lesson unlike any other. 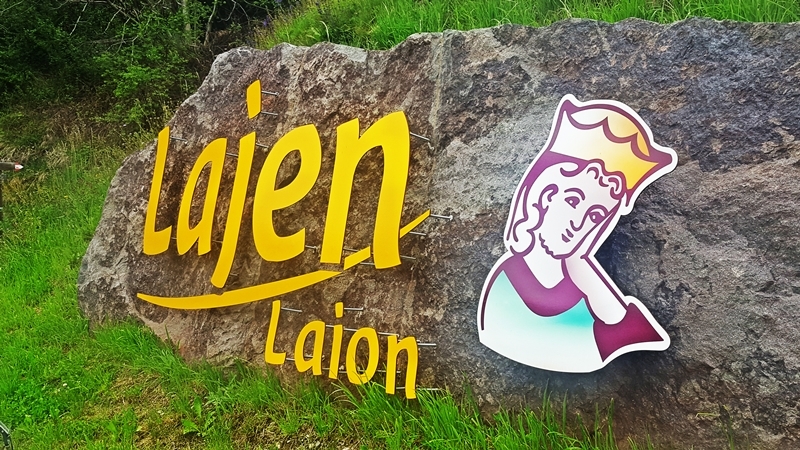 A strong case can be made that Rock & Roll’s roots lie in a land mostly associated with epic mountains, world-class wines and more castles than anywhere else in Europe. In 1170, a lad was born into the world whose gift for prose and song enchanted thousands in his time. So innovative were his lines and melodies that they continue to be revered today. Who is this medieval rock star? None other than Walther von der Vogelweide. Say that three times fast. We dare ya. Widely thought to have first seen light in South Tyrol (possibly in the villages of Lajen or Waidbruck just east of South Tyrol’s capital, Bolzano), Walther von der Vogelweide is the greatest Minnesinger of all time. What is a Minnesinger you ask? Think of them as the Jim Morrisons of medieval times. 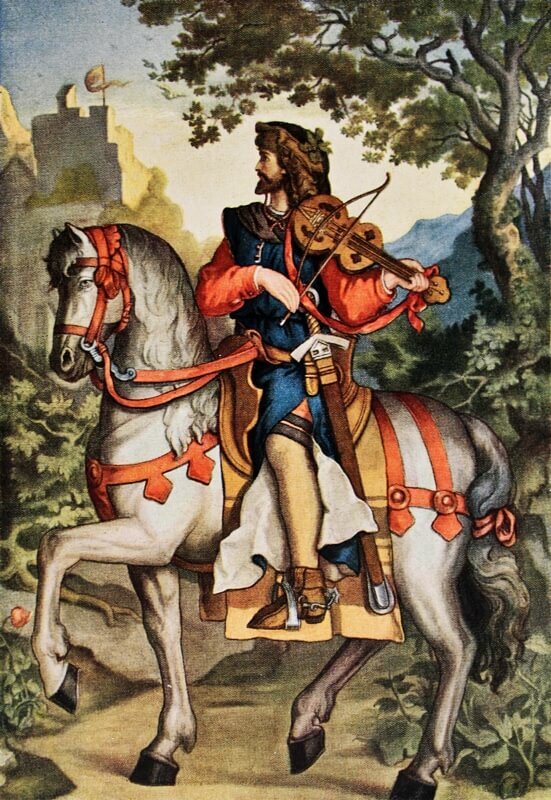 Minnesingers were musically poetic souls from Germanic lands of Europe akin to the ancient Troubadours of France. Together, they arose from the intellectual light born out of the Dark Ages in the 12th and 13th centuries. The sudden advent of their songs and poetry is one of the most remarkable events in the history of music and literature. Love The Beatles, U2, The Foo Fighters or any other musical act of modern times? Thank the Minnesingers and Troubadours of time long past. Without their ingenious mingling of word and melody with injections of a rebel yell, songs we love to belt out in the shower today would not exist. So you see, all forms of modern music — including Rock & Roll— are in a way rooted in South Tyrol. Fitting really. The jarring jagged mountain peaks of this region in northern Italy seem almost like raised fists in the air. Read on to learn more about this Rock & Roll rebel of the Middle Ages that we owe so much to. The title Minnesinger is derived from the old world word “Minne” — signifying love, which was the usual subject they were prone to sing while drawing a bow across the strings of a viol. But Minnesingers also wrote galant songs capturing the spirit of knights roving about in search of chivalrous adventure. Songs no doubt well suited to the age of the Crusades — when the world rang with the renown of noble names and knightly deeds. The face of Walther reveals a serene attitude and dignified expression that suits a long, kingly cloak falling gracefully off his shoulders. It is quite clear he was light years better looking than Mick Jagger. Can earth boast any thing more fair? So beauteous to my eyes that vision bright is given. South Tyroleans hold Walther von der Vogelweide in such high regard that in 1889 the city of Bolzano not only named its main square the “Waltherplatz” but also embellished it with a remarkable fountain, adorned by a noble statue of the tender-hearted bard sculpted in exceptional detail from the region’s renowned Lasser marble. The face of Walther reveals a serene attitude and dignified expression that suits a long, kingly cloak falling gracefully off his shoulders. It is quite clear he was light years better looking than Mick Jagger. His hands hold a viol while below him is a marbled cage enshrining a beloved songbird. Further down two lions stoutly sit upright bearing shields while opposite regal swans curve their snowy necks as if to drink the Alpine water in the basin. 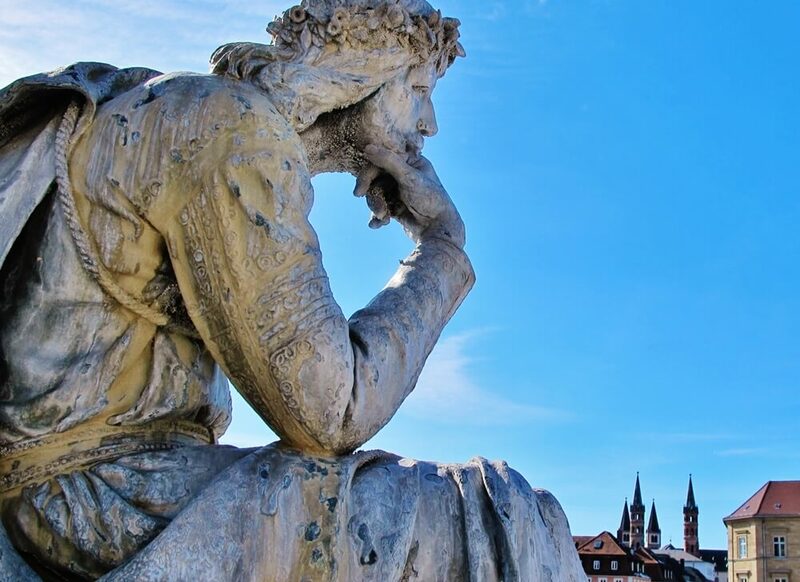 Travelers to Bolzano will find they are not the only ones to parade around the square admiring Walther’s statue. Certainly not by coincidence, birds flutter about his stately form and delight their feathers by bathing in the fountain. The lasting inﬂuence this legend has imparted on South Tyrol and our feathered friends is endearing to witness. Walther appears to have led the typical life of a Minnesinger, roaming from royal court to royal court, and castle to castle, stirring hearts and bringing cheer with his songs. His compositions were not only powerful in sentiment but showed ever delicate and elaborate poetic meter. Out of his 188 poems, at least half are written in unique measures, and all are expressed in forms invented by himself. Not even the band Rush could conjure up such musical progressiveness. Like any good rock star, Walther also used the infection of melody to rebel against religious authority and the status quo of the time. Many of his songs speak out against the long arm of the papacy. Much of Walther’s artistic glory came at the medieval court of Vienna. He made several trips and actively influenced the royals to partake in crusades, including Frederick II’s crusade of 1228 where he may have journeyed from Vienna with the holy army to at least his native South Tyrol. 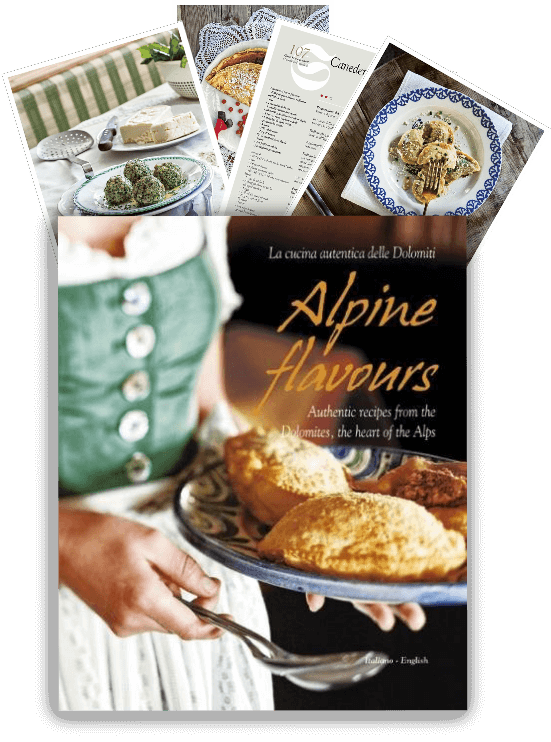 Beyond relaxing in the Waltherplatz in Bolzano, travelers interested in more encounters with the magic of Walther von der Vogelweide can partake in a scenic hike in Lajen that includes strolling sun-kissed slopes to the Vogelweider Farm, purportedly the birthplace of Walther. 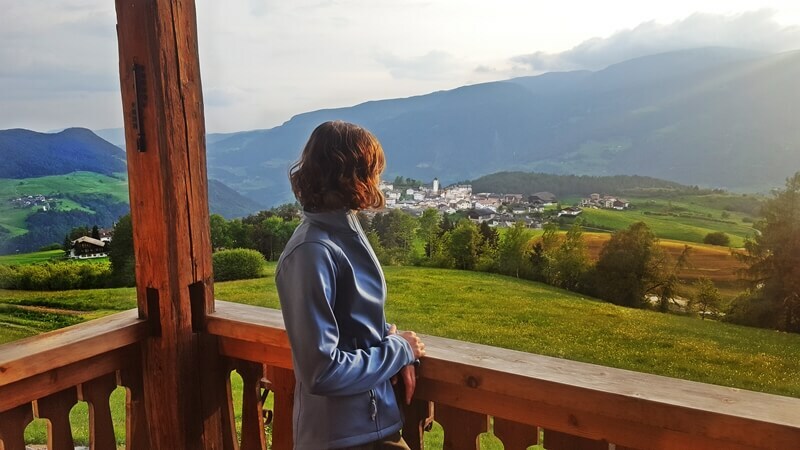 Enjoying a stunning view of one of South Tyrol’s true Alpine gems – Lajen. The 3-hour trek is enjoyable for all ages and skill levels, and the bird songs you’ll hear while walking where Walther once stepped makes it easy to see why he expressed a life-long fondness for the poets in flight. Where repose the poet’s bones. And the name of Vogelweide. Does Vogelweide Deserve a Spot in the Rock & Roll Hall of Fame? Of course, we only ask this question in jest. The obvious answer is no. No one will ever crank up a Vogelweide tune at their next house party. But it’s fun to peer way back into history to see how the roots of modern music began to form. Who knows? Without the rebellious vibe of Vogelweide, perhaps Elvis’s “shocking” dance moves in the 1950s would have never seen the light of the stage and The Beatles would forever have short hair and “Lucy in the Sky with Diamonds” would have been really about well…diamonds. What a fascinating and entertaining musical journey. It’s true music has always played a role in society and continues to do so today. Would love to listen to Walther’s and Minnesingers music. Is the best place to hear the music on YouTube? Any particular links you would recommend. A very unique article!! Thanks for sharing. Walther rocks! What ever you say makes sense and is a distinct possibility that rock’n’roll originated in Tyrol. 🙂 I like the painting of Walther riding while playing violin. This is indeed a very fascinating post. It was enlightening to read how Tyrol is the birthplace of Rock n Roll. It was so interesting to read about Minnesingers. Learnt something knew about music today. Vogelweide must have been an extraordinary man, love the magnificence of his statue erected in his honour by the people of his village. Thsi is really cool! I’ve never heard of South Tyrol and didn’t know that rock and roll could have come from there. I’d love to hear what the Minnesingers sounds like. Thank you Marissa! 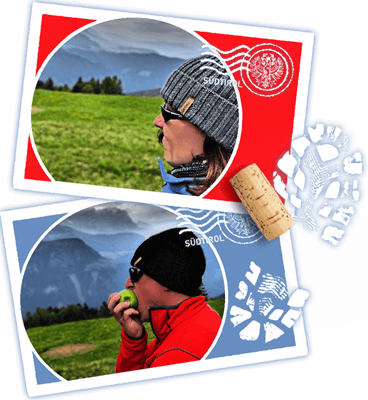 Glad we were able to introduce you to South Tyrol through Vogelweide! It would definitely be interesting to hear a remake of his songs sung in the style of that time. While I don’t think this style of music has much correlation with the roots of modern day rock n roll- I love the idea of the minstrel life. When I studied medieval literature I used to imagine being a traveling minstrel singing for a living and as a way of life. Music was tonic for the souls a thousand years ago as much as it is today! Hard to argue with you on that point Tom! More rock classics come out of England than anywhere else. It’s too bad that there weren’t recording devices back in the Medieval times so that we could hear Walther von der Vogelweide love songs sung by him today. I definitely think more of instrumental music when I think of historical music back in those times, so it was interesting to learn of a famous singer. 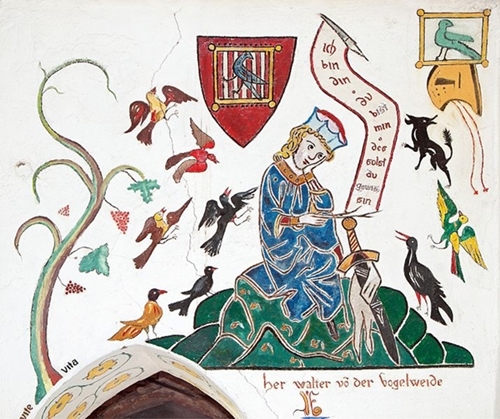 LOL I would definitely have a picture of Walther of the Bird Meadow on my wall if I’d been a teenager in medieval times – as you say a lot better looking than Mick Jagger! What a lovely story. Thank you Fiona! No doubt Vogelweide was the teenage heart throb back in the day! This is so cool! I never thought the origins could go back so far. Even I thought that Rock & Roll was born in Merica until I read this article. Very informative post! This trip looks amazing! I love history so this would be such a fun experience. Those rolling hills are gorgeous! Thank you Natalia! Hope you get to make it to this hidden gem in northern Italy! This is an interesting read. I am not very knowledgable about the history of rock and roll but feel I’ve learned a lot more after reading your post. Thanks for sharing. Thanks Sandy! Glad you found it informative and interesting. That was our goal with this unique post!